[202 Pages Report] The Top 10 Fabrics Market and it includes an analysis on technical textiles, performance fabrics, and non-woven fabrics/non-woven textiles among the other high growth fabrics markets. In this study, 2015 has been considered the base year, and 2016–2021 the forecast period to estimate the top 10 fabrics market size. Note1 : Core competencies of the companies are captured in terms of their key developments and key strategies adopted by them to sustain their positions in the market. The top 10 fabrics value chain includes, fabric manufacturers such as, E. I. du Pont de Nemours and Company (U.S.), Koninklijke Ten Cate nv (Netherlands), W. L. Gore & Associates, Inc. (U.S.), Low & Bonar plc (U.K.), Teijin Limited (Japan), Saint-Gobain S.A. (France), BASF SE (Germany), Kimberly-Clarke Corporation (U.S.), 3M Company (U.S.), and Gentherm Incorporated (U.S.). This research report provides an analysis of the top 10 fabrics market and also their segmentation, on the basis of type and application. Top 10 fabrics are used in various industrial sectors such as building & construction, automobile, electricals & electronics, medical, and personal care. 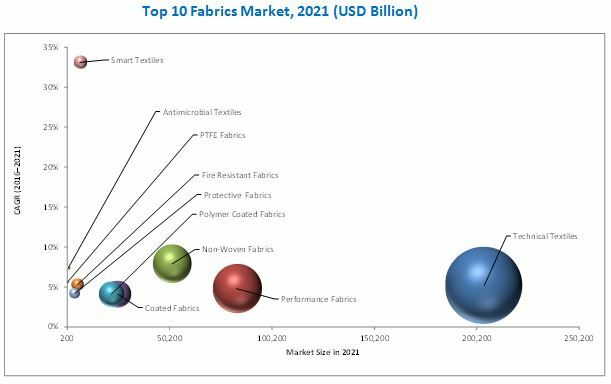 The top 10 fabrics market has been segmented into various markets such as, antimicrobial textiles, polymer coated fabrics Polytetrafluoroethylene (PTFE) fabrics, and many more. Antimicrobial textiles are fiber based substrates on which antimicrobial agents are either coated or incorporated, to either kill or inhibit the growth of microorganisms. These are used for applications such as, sportswear, workwear, protective wear, curtains & drapes, carpets, surgical supplies, bedding, intimates, and footwear. The antimicrobial textiles market is witnessing high growth owing to increasing end-use applications such as medical textiles and apparel. The growth in the antimicrobial textiles market is also backed by the growing healthcare market and increasing awareness regarding health and hygiene. Polymer coated fabrics are manufactured from various mixtures and emulsions of different polymers or using individual polymers such as PVC, PU, PP, PE, and nylon among others. Polymer coatings provide various properties to fabrics. Polymer coated fabrics have advantages such as, high resistance to fire, water and abrasion, and are relatively inexpensive when compared to other coated fabrics. Factors such as, the surging demand from the transportation, protective clothing, and industrial applications and increasing safety concerns and stringent government regulations for the provision of safety to workers are expected to augment the growth of the global polymer coated fabrics market. PTFE fabric commonly known as Teflon, is used in end-use industries such as, construction, chemical, food, packaging, and textile, among others. The PTFE fabric has various notable properties such as, being non-stick, friction-free, self-lubricating, non-flammable, non-brittle, and non-toxic; and is resistant to atmospheric conditions, fungus growth, and chemicals. The rising demand from the construction industry in applications such as, pipe and line fittings, tubes, rods, and for constructing roofs or sheets, and also the rising demand from the medical industry in applications such as, cardiovascular & peripheral vascular grafts, plastic surgery, orthopedics, and dental, among others, are driving the growth of the PTFE fabric market. Some of the key players in the top 10 fabrics market are, E. I. du Pont de Nemours and Company (U.S.), Koninklijke Ten Cate nv (Netherlands), W. L. Gore & Associates, Inc. (U.S.), Low & Bonar plc (U.K.), and Teijin Limited (Japan), among others. These players compete with each other, in terms of prices, and offer a wide range of products to meet the market requirements. The companies are primarily focused on research & development of new products for the market and this is evident in the high number of new product launches. 14.3 W. L. Gore & Associates, Inc.